We started the new year off with a bang by having Kurtis and Brent over to play a few games. 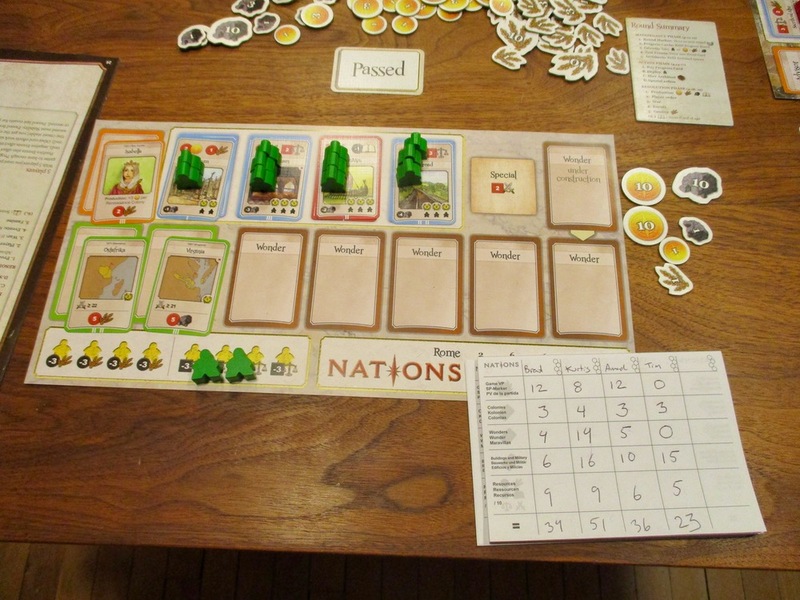 To start off Kurtis, Brent, Amanda and I played a game of Nations. 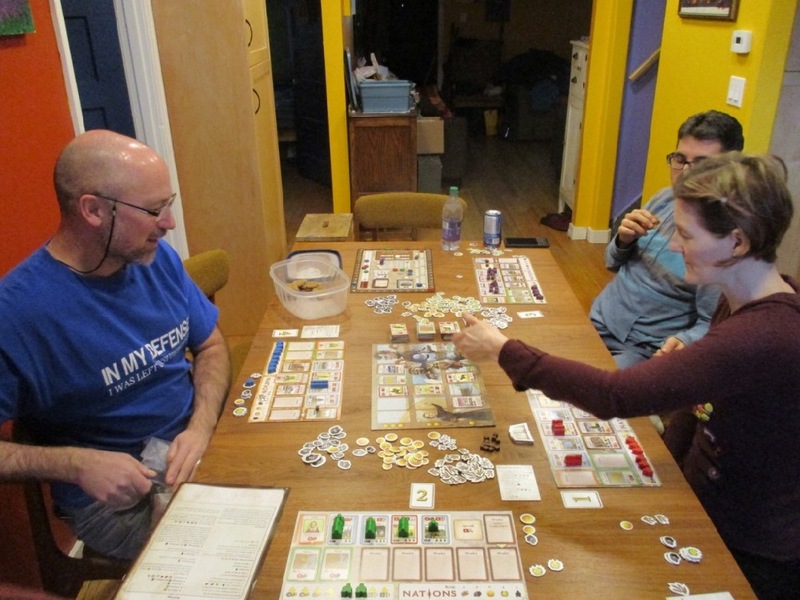 I played Rome, Amanda played Greece, Kurtis played Egypt, and Brent played Persia. 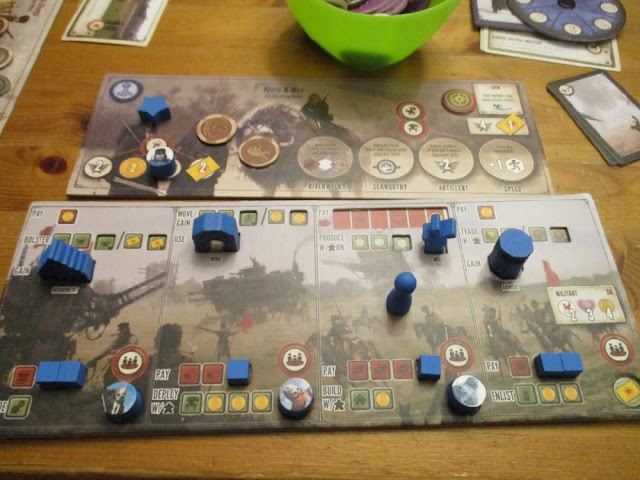 This was a bit of a departure from the last few games I’ve played where I played China and tried to focus on Stability and Grain production and more or less ignore military and wars and stuff and grow population as much as possible to get piles of meeples on industrial age buildings at the end of the game for loads of victory points. So, I thought I’d go a different direction and do military…. 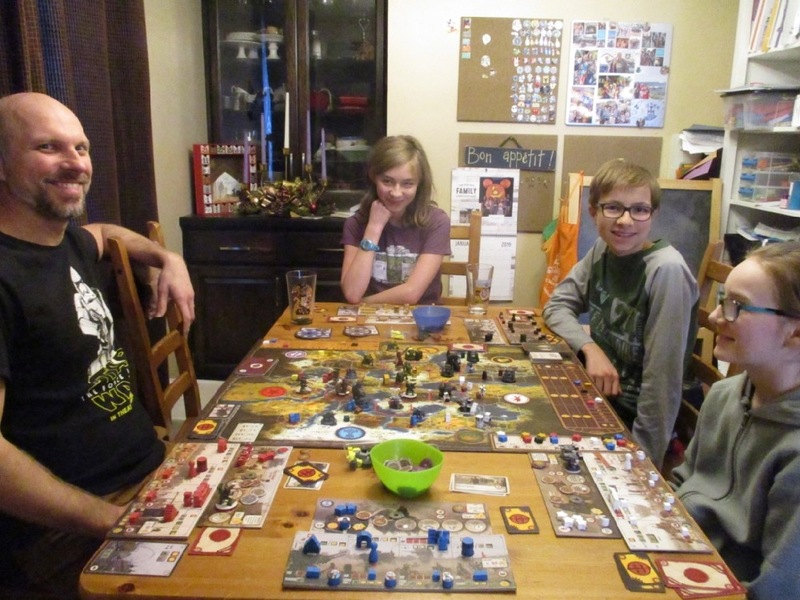 I took a break from gaming to make supper for everyone, but The Girl joined them to play Century: Golem Edition. Brent ended the game taking five cards… at the end of the game Kurtis had 4 cards, The Girl had three, and Amanda has only two… however The Girl ended up winning with 57 points! Brent and Kurtis both had 55, and Amanda had only 40. 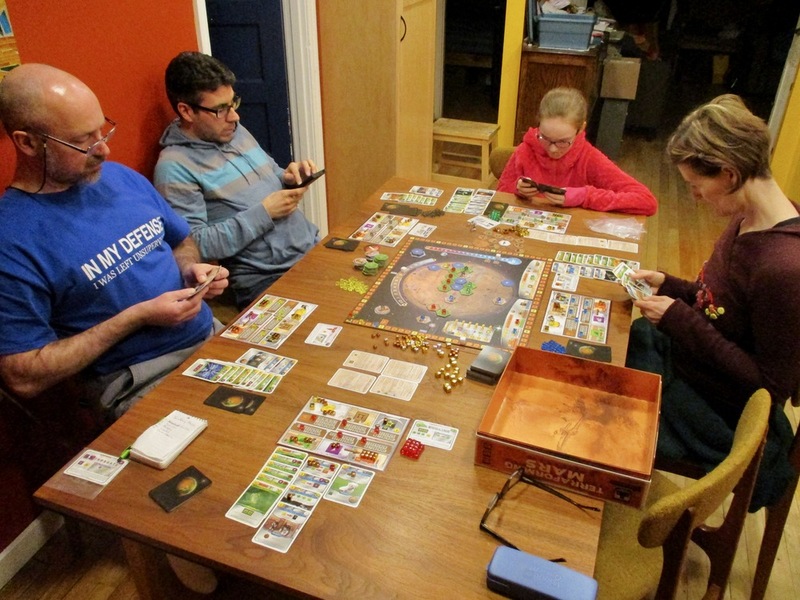 After supper we played Terraforming Mars (again – it was the third time we’d played in the last week!). This time we played with the Corporate Era cards and advanced corporations. I had Ecoline – starting with just 36 Megacredits and some plant production. 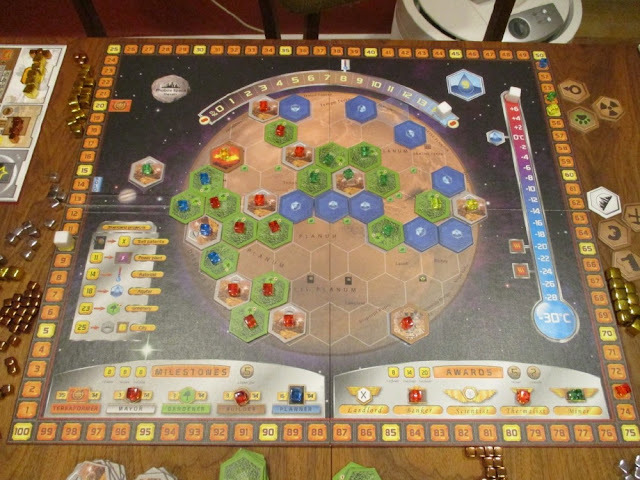 Brent played Teractor – which I think gave him some benefits with anything with the earth tag and he started with 60 Megacredits!!! Kurtis played Phoblog – I have no idea what they did – he was on the other side of the table and kind of just did his own thing. 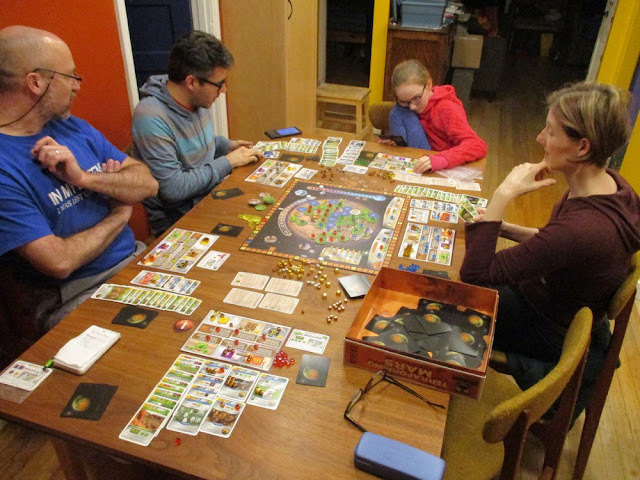 The Girl played Inventrix – I’m not sure what she was up to either… Amanda played the Tharsis Republic – she got additional money production any time someone played a city. Playing with the advanced cards was super fun and added a whole bunch of different options to the game. It was a lot longer game and, while in our previous games the temperature was always the first thing to just shoot up, temperature was the last to be raised in this game. We covered nearly the entire planet with tiles – there was only two spots that remained uncovered – and that was because they were reserved for water tiles… and there were no more water tiles… I totally forgot to take a picture at the end of the game with everything all covered up. I think there were 15 cities…? 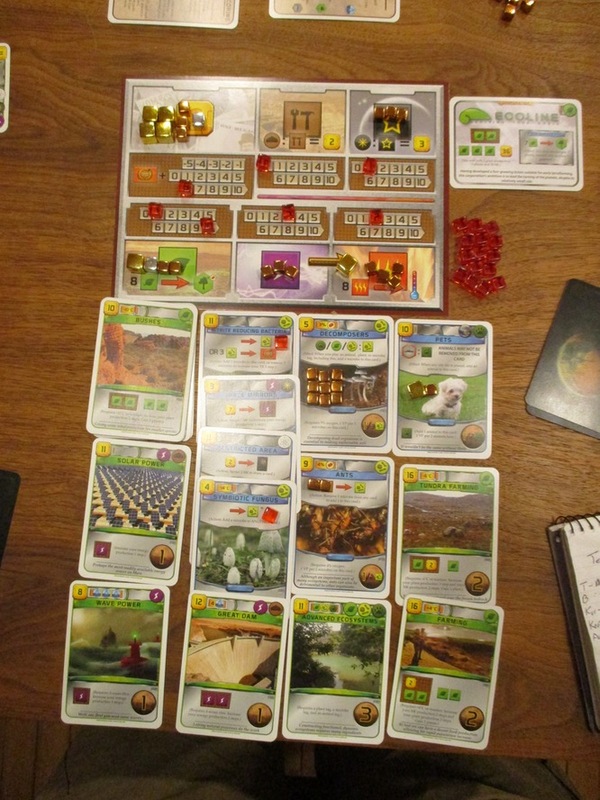 I think Amanda had an additional +30 Megacredit production by the end of the game – on top of the money collected for her Terraforming Rating. She also had 20 Energy production – and a card that turned energy into Megacredits one a one for one basis. 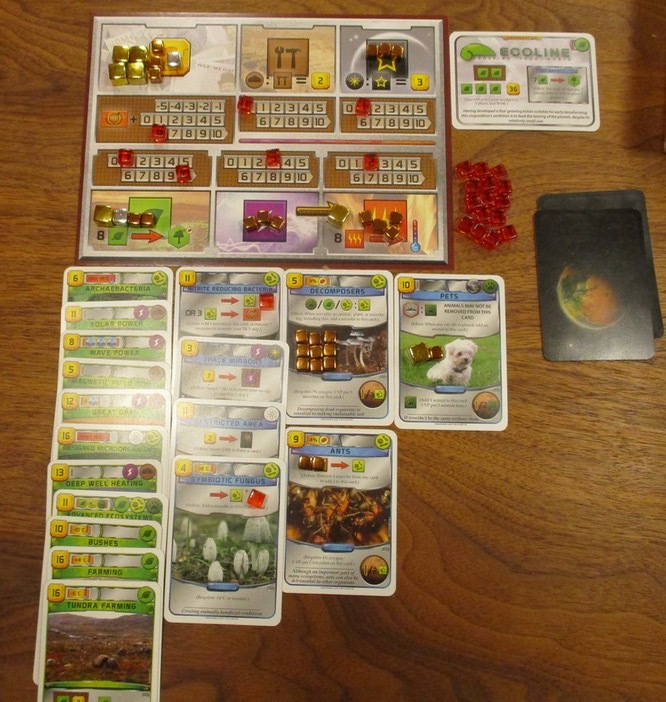 AND she had the Martian Rails card, which, for the cost of one energy, she could collect one Megacredit for each city (remember when I said there were FIFTEEN!?). By the end of the game she was buying every card she researched and played them every round!? 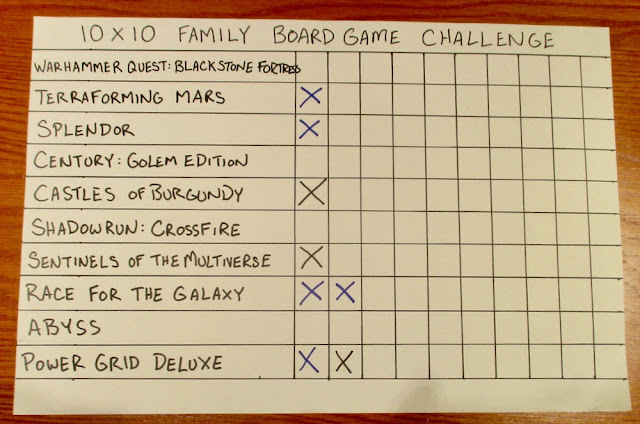 Despite two of those games being on our 10x10 list – the entire family didn’t play either (Finnegan spent the day doing things on his own – mostly watching videos on the computer), so I’m not counting them. 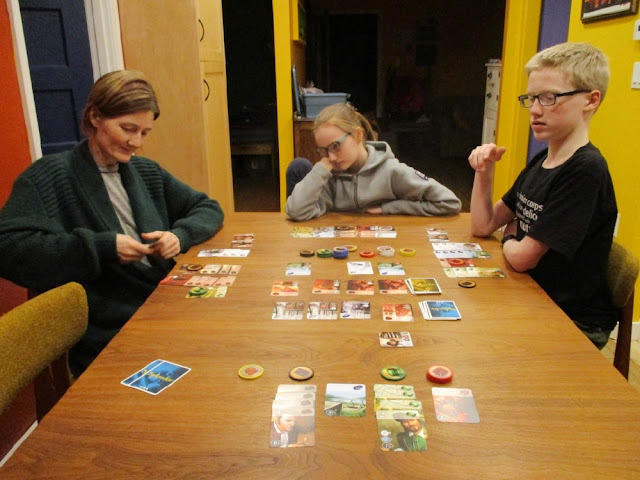 Later in the evening we played Splendor as a family. 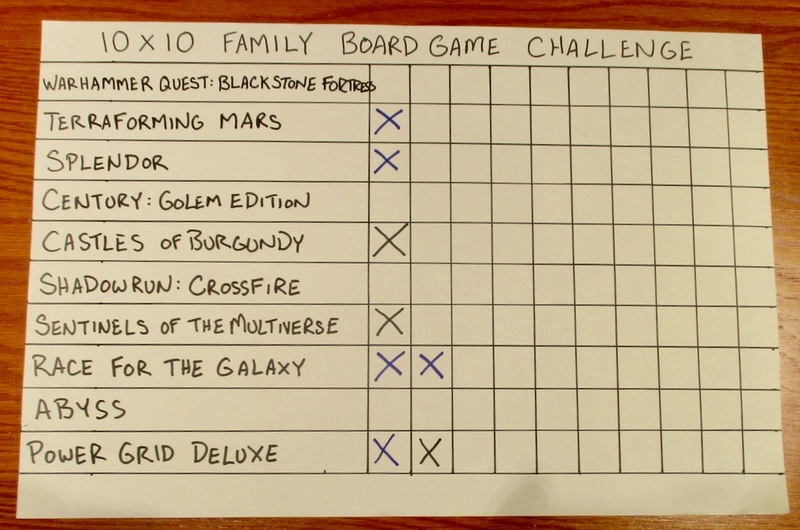 This was the first official play for our 10x10 Family Challenge. Amanda just hosed us again – scoring 18 (when she only needed 15 to end the game). Finnegan was pretty close at 12, but The Girl and I were waaaaaaay behind… with 5 and 8… both of us probably would have caught up in a round or two. But it was a round or two too late! Second official 10x10 game – Race for the Galaxy with all the first three expansions – which is what we usually play with, but we’ve made a pact to separate out the cards and try out the other two expansions this year. We’ve had the other two for some time, but are not playable with each other or any of the first three, and so we’ve never gotten around to playing them. 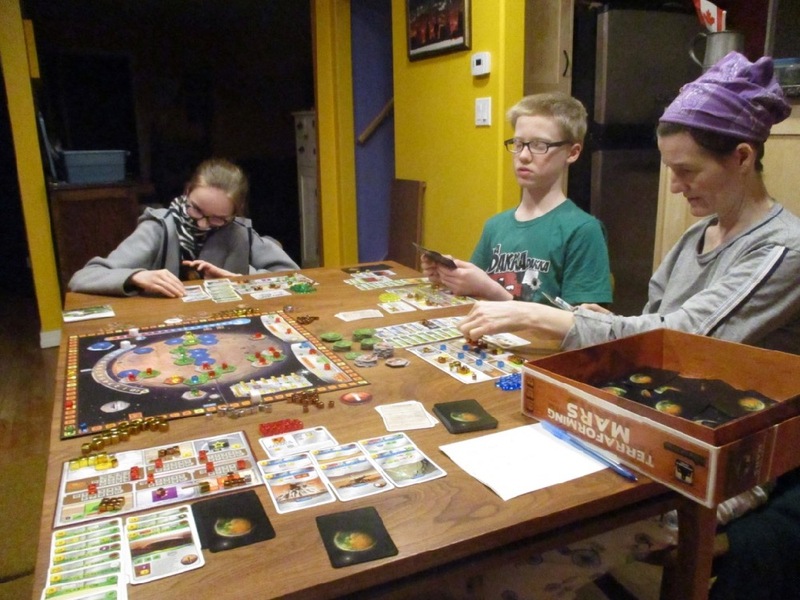 For this game, I started off with The Ancient Race, Amanda had the Rebel Cantina, Finnegan had the Uplift Mercenary Force, and The Girl had Earth’s Lost Colony. Despite starting off with a few cards that suggested I might go with a Gene Theme, I just kept picking up Alien cards and went with that. 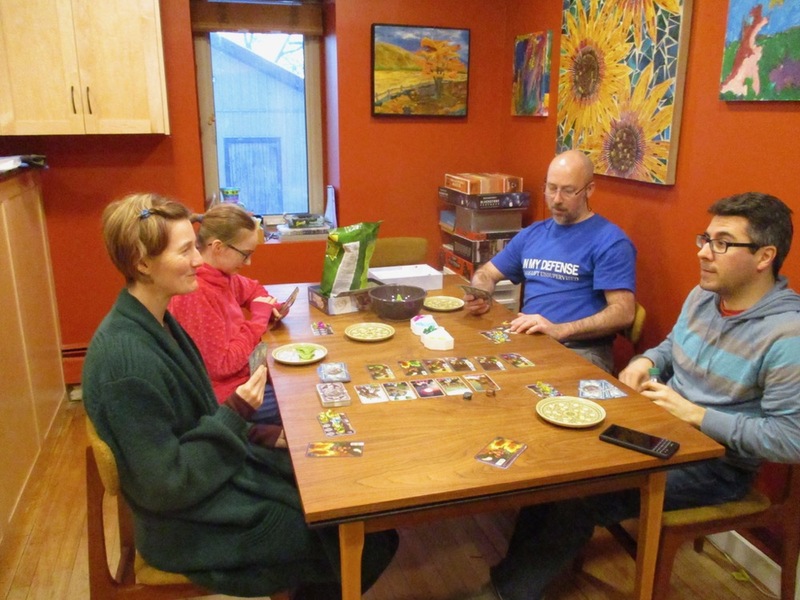 Though Amanda had the “Rebel Cantina” she had as many Imperium cards in her tableau as Rebel – perhaps they were infiltrating the Imperium administrative architecture to take over from within…? 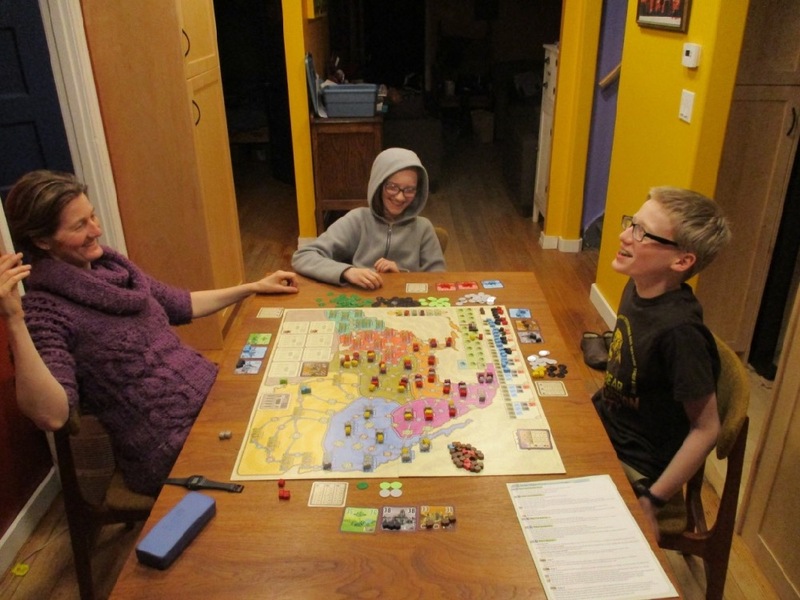 She totally rocked this game, scoring 81 points – probably her best game ever. I did not-so-bad with 64. Both the kids were in the 30s. Finnegan celebrated his 15th birthday on Saturday (Yeah, FIFTEEN!!!) 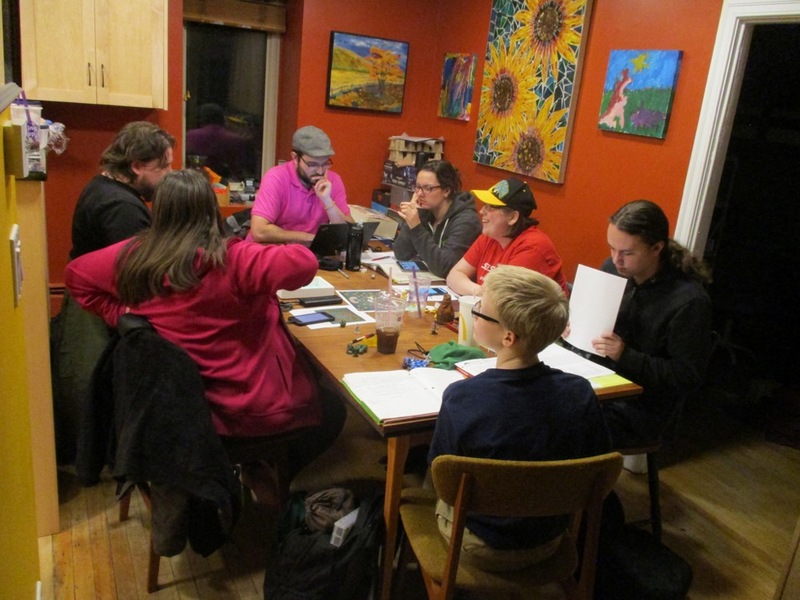 and invited a few friends over to play Dungeon Crawl Classics. They all made characters together and then he ran them through the same adventure funnel-adventure he ran the family through a few months ago. 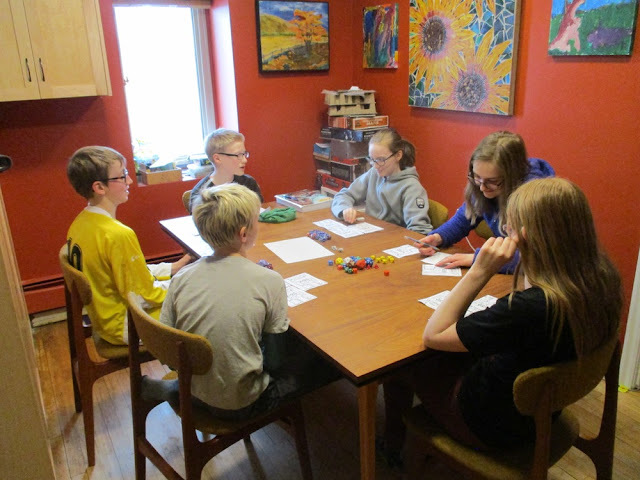 The idea of the funnel adventure is you start with a bunch of 0-Level characters – Fifteen of them between all the players – so when he ran it for Me, Amanda, and The Girl we each started with five characters. With this group, they only started with three each. All these 0-Level characters are ordinary citizens that have decided to give up their mundane jobs and become ADVENTURERS! They are potato farmers and money lenders and barbers and such (and have stuff like pitch forks and mules and scissors for “equipment”). Generally, they die like flies during the funnel adventure and the hope is that you have at least one survive to the end that then becomes a Level ONE adventurer of some sort. He wasn’t sure how far they’d get (as we played all afternoon and late into the evening and only got through the funnel adventure), so he planned for a full afternoon and evening (with a break for pizza and cake). But they all finished the funnel adventure before I’d even made the pizza! So, while I was making pizza they levelled up and after supper started a first level adventure he has! I was really hoping they could sort out a time (at least MOST of them) to get together on a regular basis and continue this campaign. They’re all such busy kids! In addition to the regular game going on, there’s this whole extra Xenos Invasion phase at the end of the turn where cards are drawn to see the strength of the Xenos invasion and you have to have enough military/defense to deal with it or one of your planets gets damaged. You can gain extra Victory Points by contributing to the war effort or defeating the Xenos invasions. 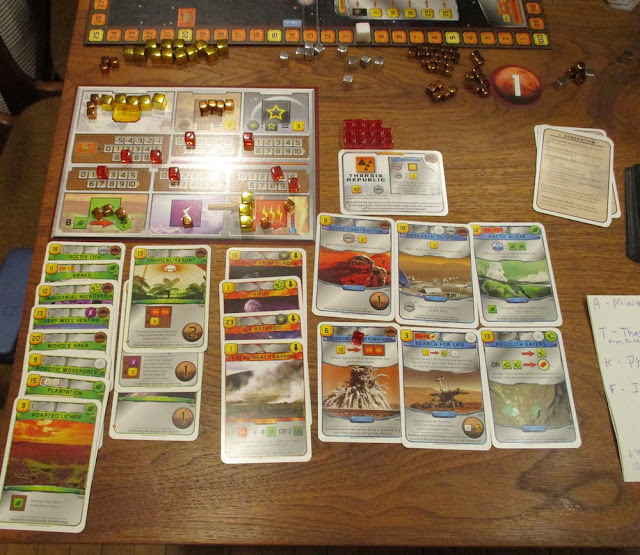 Later in the evening we got in ANoTHER game of Terraforming Mars. 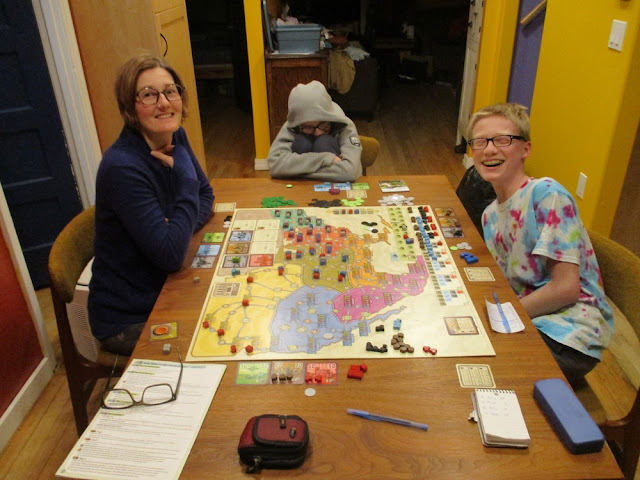 It was the first the family played together, but, I think, the fourth game we've played in the last two weeks!? 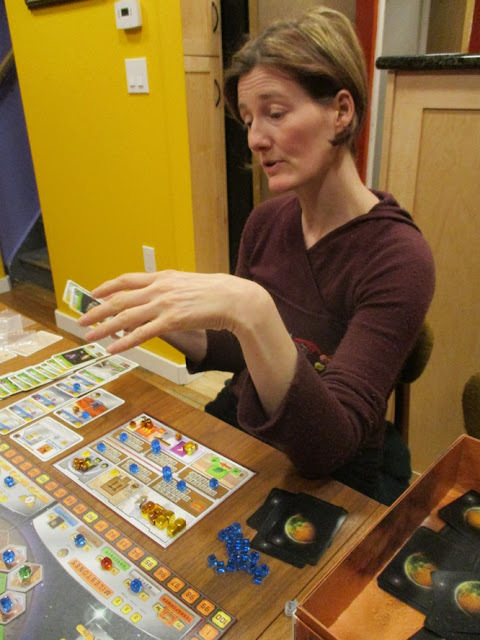 This time I played the Tharsis Republic - the same one Amanda played in the previous game - and I totally crushed it. I ended the game with 73 points and the rest were in the 50s. It will be interesting to see if whoever plays Tharsis Republic always does this good! I was also a LOT more selective about what cards I took in the research phase. Unless I could do it THAT TURN or it was AMAZINGLY good and worked really well with other things I already had on the go and I would for sure be able to do it within a couple turns, I just pitched it. Amanda again ended the game with a mitt-full of cards that she never did get into play. There are so many cool cards in the game, but you just can't do them ALL!!! The map of Mars looked quite different compared to out previous game! I think we had completed getting all the water out and the oxygen up to 14% before the temperature even got to -10°C!? And waaaay less vegetation compared to our previous game. Finnegan has devised a bit of a narrative/tree campaign for Sentinels of the Multiverse. I have to admit, I've forgotten the fluff about it - something about Ambuscade (the villain) attacking the Freedom Tower looking for something...? I played Haka, The Girl played The Harpy, Amanda played The Naturalist, and Finnegan played Parse. Eventually we defeated Ambuscade and prevented him from stealing... whatever it was he was trying to steal...? On Saturday, The Girl and I went over to a newish friends' house to try out Scythe. I say "newish" because we met two and a half YEARS ago and have been trying to set up some sort of game since... and it's just never seemed to work out!? Well... finally it worked out. In this game I played Bjorn & Box of the Nordic Kingdom. The Girl played Anna & Wojtek of the Republic of Polania. I kind of ended the game this time, by attacking the Rusviet Union - both of us had one star left and whoever won the battle, would put their star out and end the game (it wasn't me). Once again, I was kind of felt like I was only just starting to get a clue by the time the game ended - but at least I was having more fun playing this time. Also, if feel like I have enough of a clue, this time, that if/when I get to play again I'll have a better idea of what I'm doing. I can now kind of see why the game is so popular. Not that I'm going to run out and buy the game - I know people that have it and can go play it with them! Doug - our host - had done an amazing job of painting up all the little minis for the game - which, for me, really added a lot to the game. Later, in the evening, Amanda and I headed out to the first session of a new Call of Cthulhu game my friend Bruce is running. Like the previous Cthulhu game he ran - this one is actually using the Call of Cthulhu rules - rather than Savage Worlds: Realms of Cthulhu. He's warned us it won't be so two-fisted and pulpy like the Savage Worlds campaign - and we should expect it to be much more dark and brutal and to have secondary character concepts ready... yikes! We mostly just made characters - although Amanda and I had made our characters beforehand, so we kind of just sat around chatting while the others made up or finished off theirs. We did just start the first adventure... and then had to call it a night. 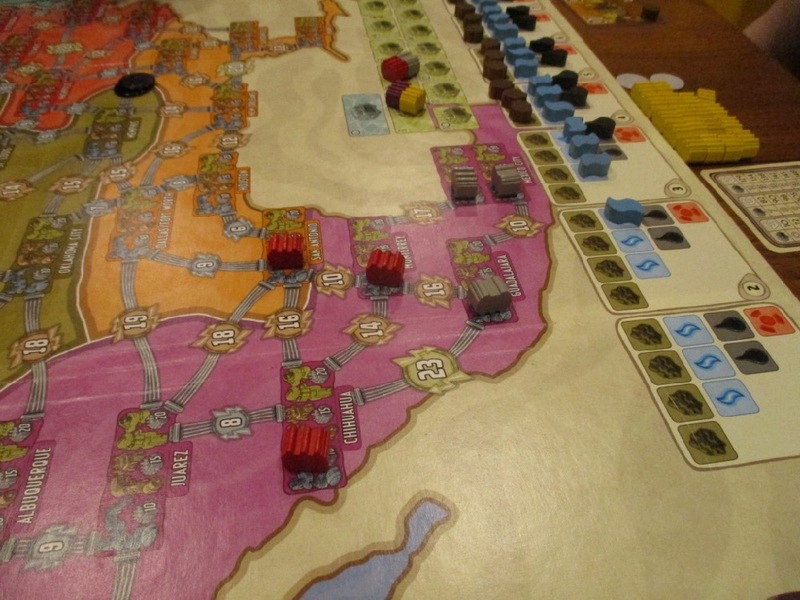 Sunday we played Power Grid Deluxe. It was actually The Girl's suggestion, but I was happy to play as I knew the next weekend I'd be playing it at FreezerBurn and knew I could do with a memory refresher. 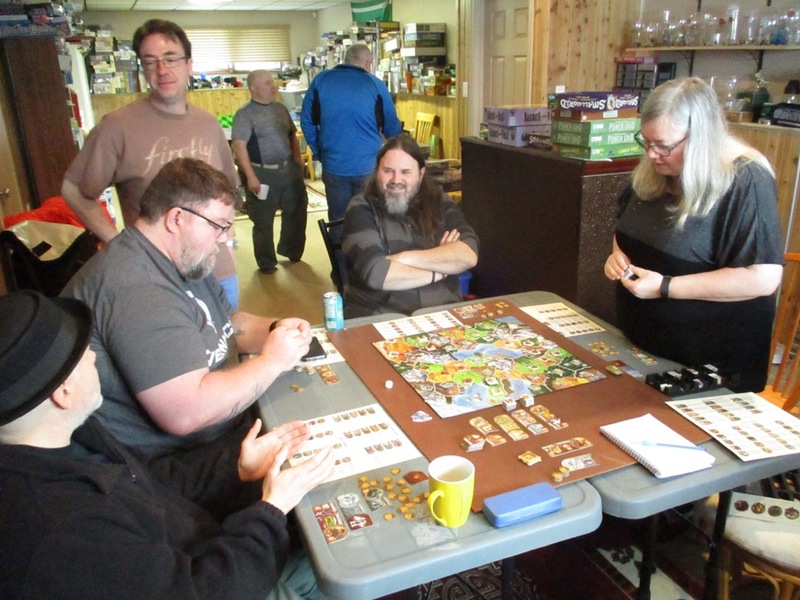 We played with the North American side and used most of the Northern regions. I kind of set up in a bottle neck and had the whole of the Northwest to expand into - this probably wasn't the BEST idea as the connection costs were VERY high. Amanda ended up winning the game by powering 16 cities. I wasn't very far behind at 14 and the kids each were able to power 13. 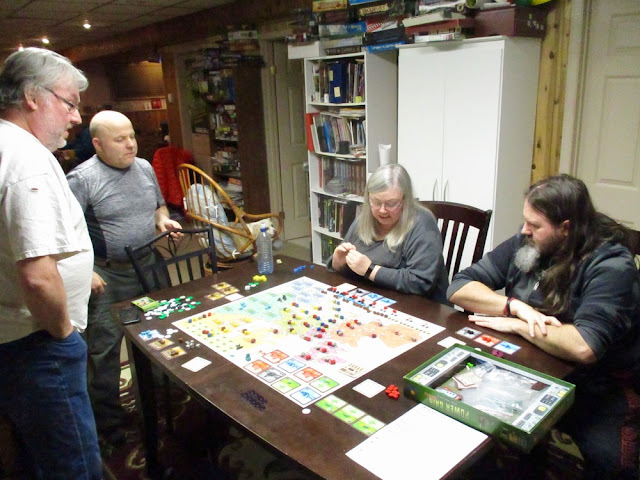 On Friday I convinced the family to play another game of Power Grid deluxe with me, so I could get some "practice" for Freezerburn - which was the very next day. We played on the North American side again, but picked different regions to play in. Despite that initial set-back, she still did VERY well! We ALL did! By the end of the game we ALL were able to power 17 cities! It came down to the tie-breaker - Money. 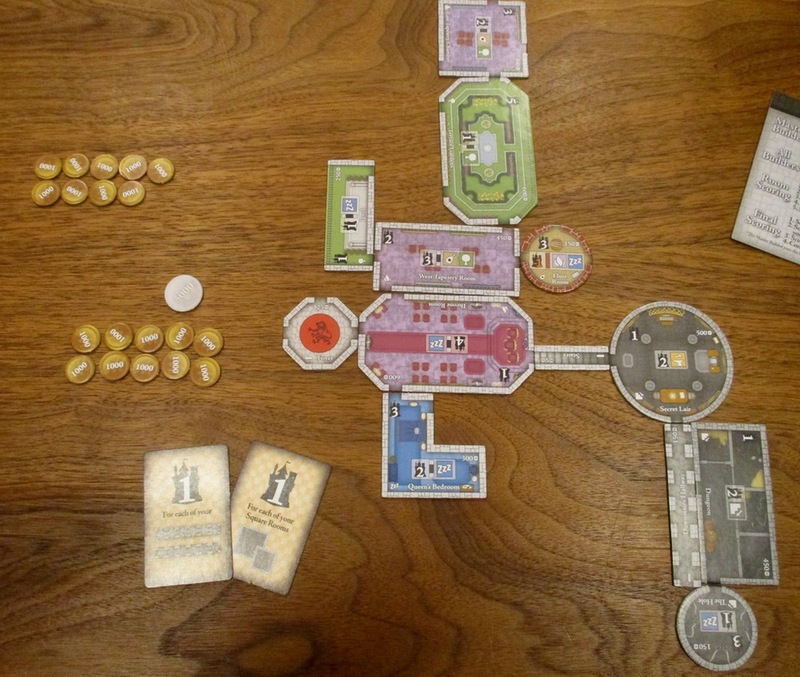 I actually ended up winning this game, largely because I was a little more conservative with my bidding on generators. WOO! I'm pretty sure this is the first (and probably LAST!) game of Power Grid I've ever won! Saturday morning I headed over to John and Brenda's place for FreezerBurn - and annual day of gaming that John hosts every January. 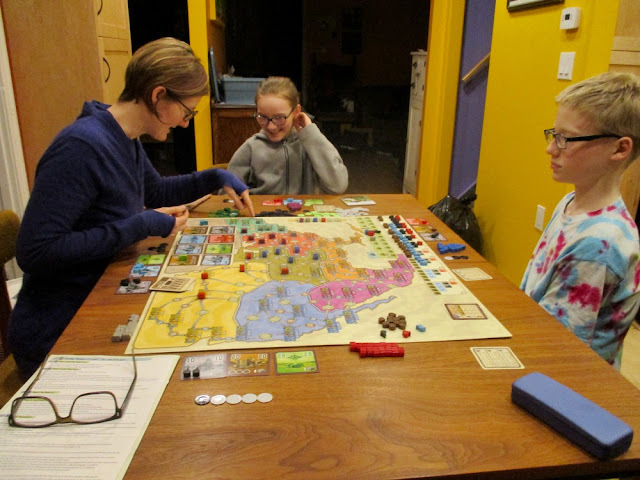 Yeah... all that "practice" I got for Power Grid? Did not help AT ALL - came in dead last! 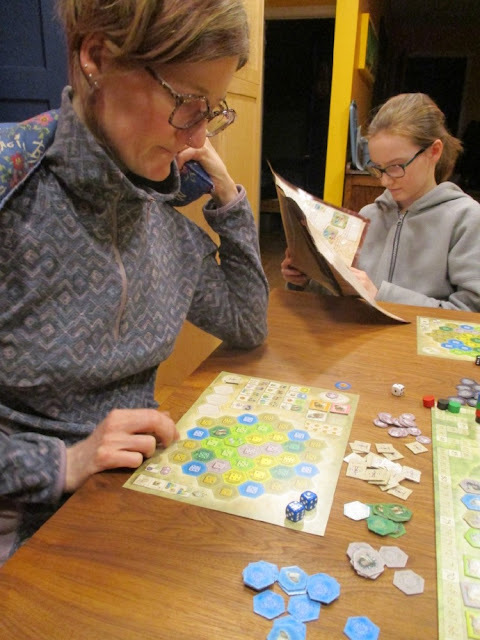 Sunday the family got in a game of Castles of Burgundy - another one of our 10x10 Family Challenge games. This was the first time we tried it with the not-so-identical maps... The one above is mine. 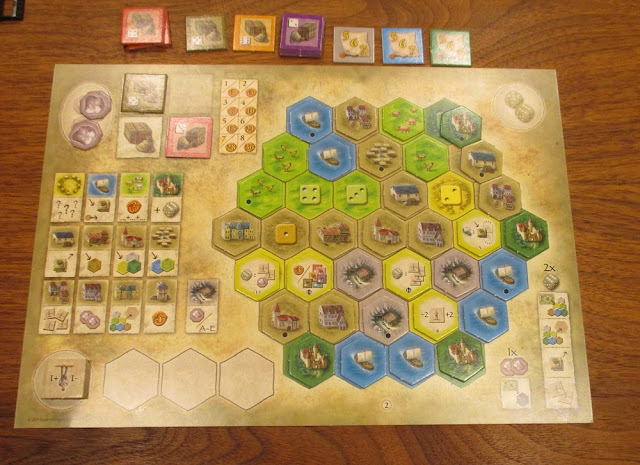 It was quite different from the ones that are identical - all my starting spaces are along the outside and each of them is adjacent to only two or three different types of hexes. 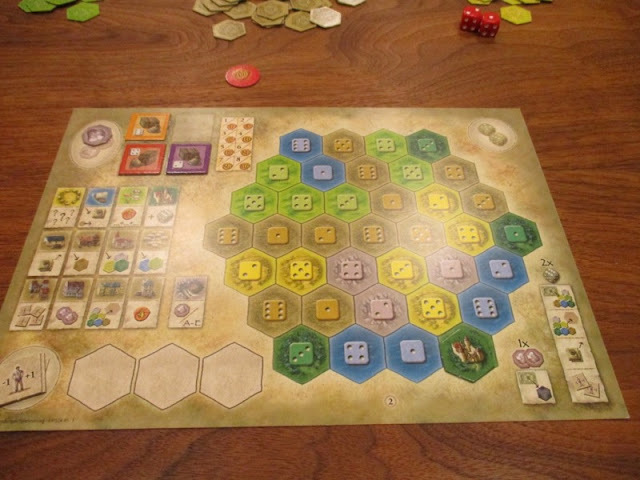 I had one HUGE region - 8 hexes of City...? Where buildings get placed - which could mean HUGE points if I managed to fill it. Amanda's were a little in from the edge and she had a bit more in the way of options for what to do and where to go. She had a rather large pasture area. In the end I wasn't quite able to fill that big city area... To fill it I needed one of each building type and in the second last round Finnegan grabbed the last of the one I needed - not beause he was paying any attention to my board and what I needed - he simply grabbed it because he has an upgrade tile that allowed him to build more than one of any type of building in any of his urban regions AND he had a scoring tile that game him four bonus points of each of that type of building in his land... So it wasn't malicious thing he did... but it still robbed me of at least 36 points! Which might have put me into second place. Lesson learned - if you have a HUGE area like that - get working on it RIGHT AWAY! make it a priority to get it done! Finnegan totally won this game with 243 points! Amanda and The Girl weren't far behind with 225 and 208 respectively... I was the only one NOT to break 200 points... taking up the rear with 198... Ah, well. it was fun. Looking forward to playing more of this throughout the year. Monday evening our friends Leanne and Taotao came over. 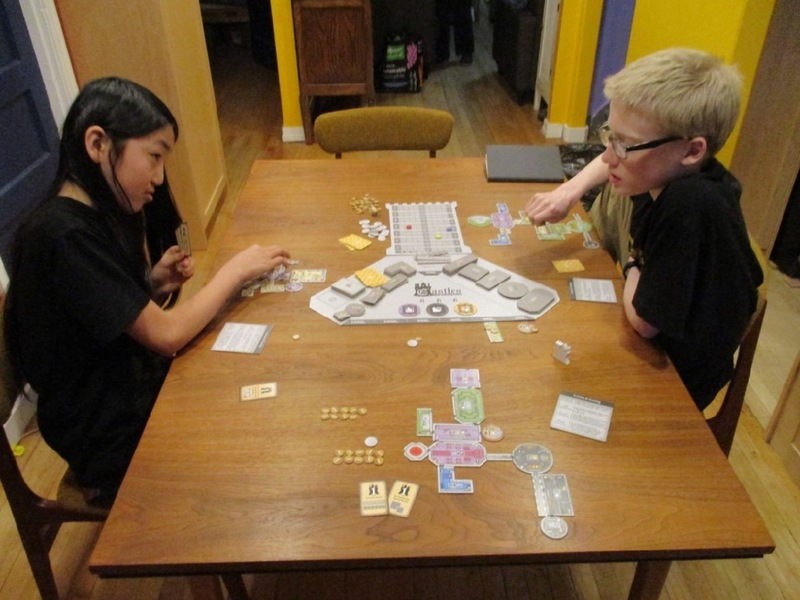 While The Girl and Leanne were painting Finnegan, Taotao, and I played a game of Castles of Mad King Ludwig. It seemed to go REALLY FAST! 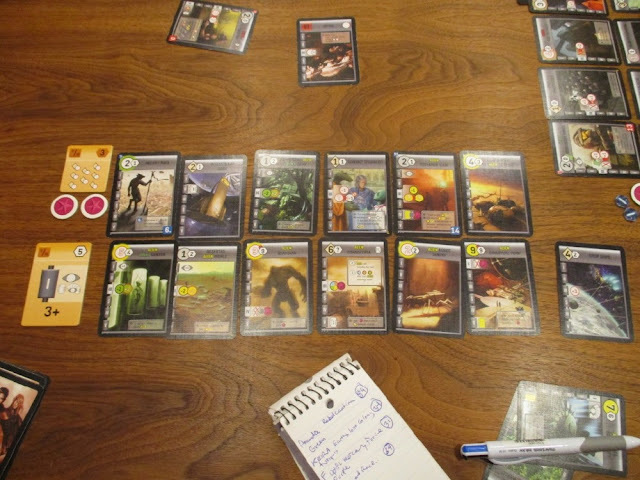 Though I somehow ended up winning, despite having next to none of the types of rooms that got me bonus points at the end of the game, I didn't find it a very satisfying game. Not because of anything Finnegan or Taotao did, it was mostly because I wasn't happy with my layout... I mean, I generally don't care if I win or lose the game as long as I come up with a cool-looking castle! I guess I DID get a secret underground lair... so there was that... but the rest...? Well, it wasn't my best Mad Castle! In the morning a friend of the kids' came over. He had the day off school and spent the whole day with them. 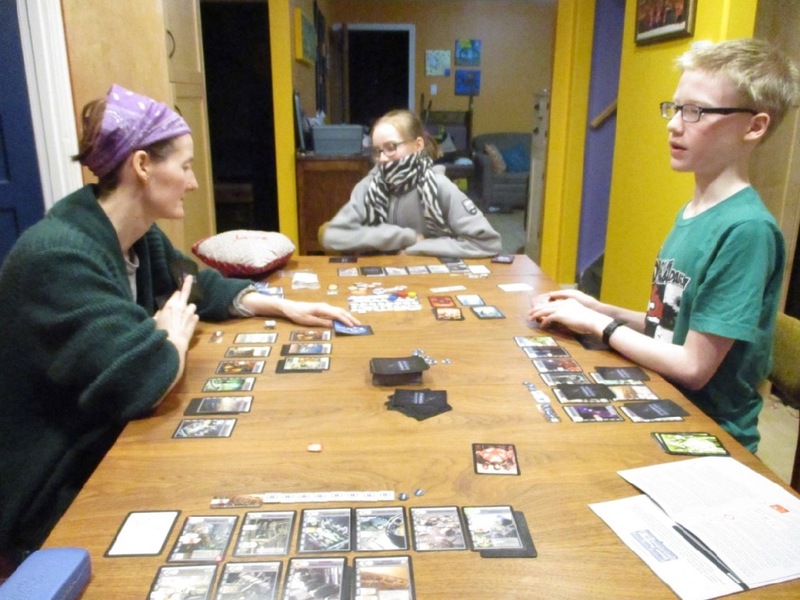 They played Unstable Unicorns and The Girl ran the others through a game of Dungeon Crawl Classics. I was busy clearing stuff out of the way in the basement for the boiler repair guys to come and do some work on our boiler, so I didn't play with them or take any pictures. And that's about it for gaming! Whew! What a month! 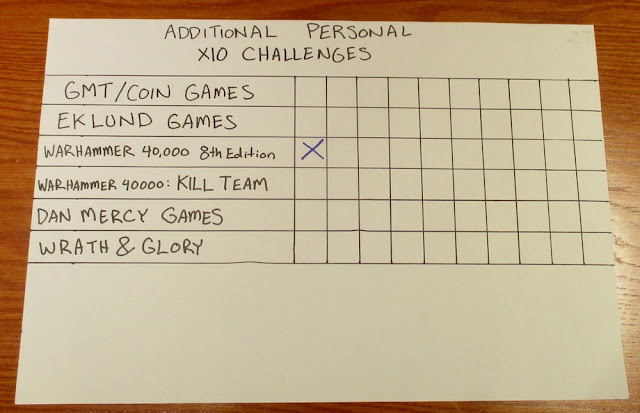 We did okay on the 10x10 challenge - knocking 8 games off - at that rate we should easily complete this challenge this year! 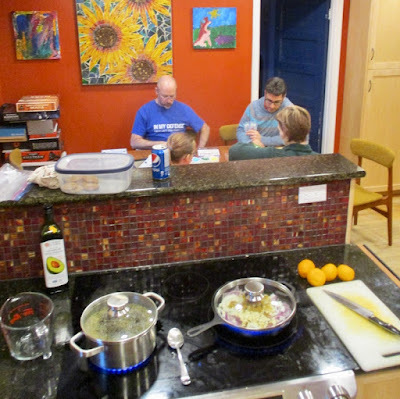 We've been doing a pretty good job of keeping Fridays and Sundays open for "Family Game Nights". 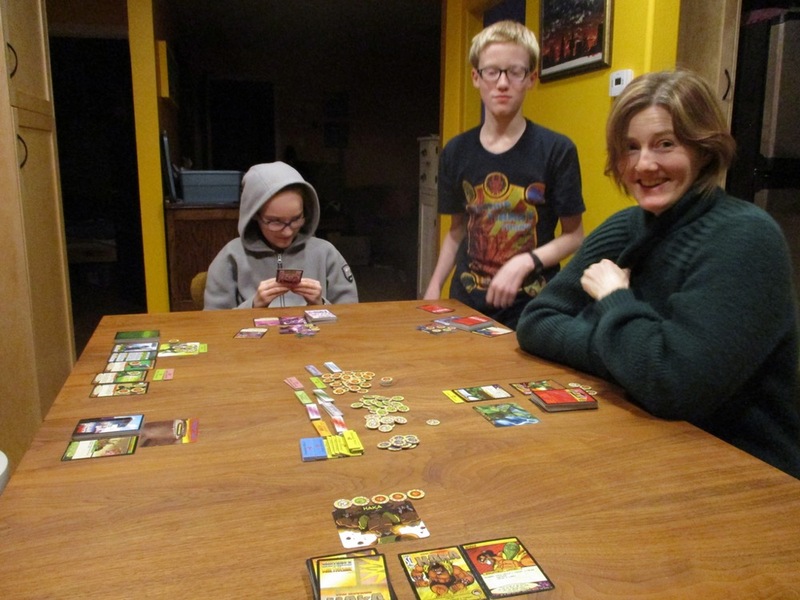 Our next game is planned for Friday evening - Finnegan will run us through the second scenario of his Sentinels of the Multiverse campaign. Saturday evening Amanda and I are out to play Call of Cthulhu again while Finnegan will be running his Dungeon Crawl Classics game again. 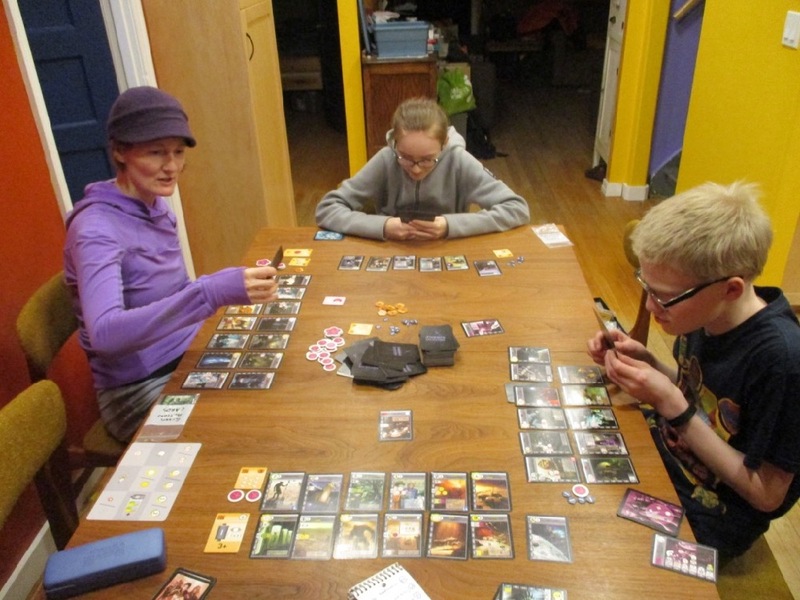 Sunday evening we're planning on playing Abyss! I didn't get so many of my OWN Personal Challenge games in... 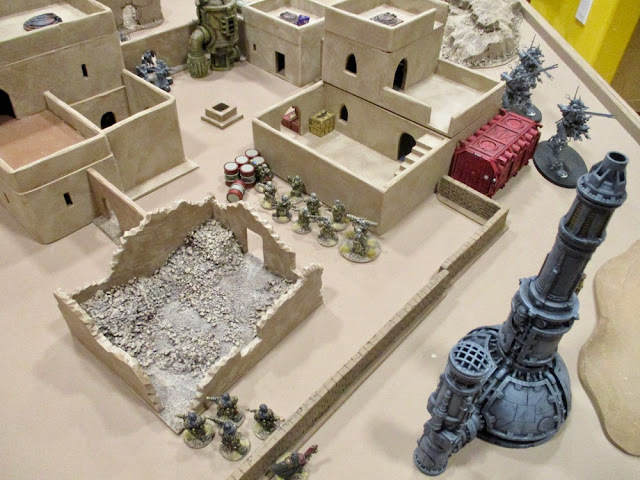 I am also hoping to get in a game of 40K or Kill Team this weekend on Saturday and/or Sunday afternoon! And MORE 40K on the weekends through most of February - including some practice for the Apocalypse event at the beginning of March. Starting in March I'm going to try and play a game on the list every weekend - Saturday or Sunday afternoons - one GMT/COIN game and one Eklund game each month! Next weekend I have a group coming over to make characters for a Wrath & Glory game that I'll be running on the Saturdays that I'm not playing Call of Cthulhu. I'm going to start off by running the Dark Tides series of adventures. There are five adventures each played at a different Tier - so I'll probably have them all make a new character for each adventure - that way they'll have an opportunity to try out a bunch of different archetypes and play at different tiers. After that I'll probably start a new campaign. The following weekend is my annual Winter Wargaming Weekend - except this year it's going to be a winter ROLE-PLAYING Weekend due to a slight change in plans! I'm going to try and run a different group through the Dark Tides set of adventures for Wrath & Glory. Though we did get in a fair few boardgames - and even a few role-playing games, it's been a VERY slow month for painting! I only managed to finish off four Ur-Ghuls and a pair of Valhallans!? What is up with that!? Going to need to step up may game if I ever want to play Blackstone Fortress before the end of the year!! Hopefully a game report of a 40K or Kill Team game this weekend... then maybe some new minis? I have a bunch I want to try and get done before the game weekend - for both player characters and their nemesises....? Nemesii...? Their ADVERSARIES!? Wow,lots of games, I'm not surprised you don't have time to paint! Ha! I guess! There was also a lot of movie-watching during the month... Now, usually movie watching means I get a lot of painting done, because it sit in the room and listen to movies while painting... but for some reason, this month, I've spent a lot more time actually WATCHING the movies...? 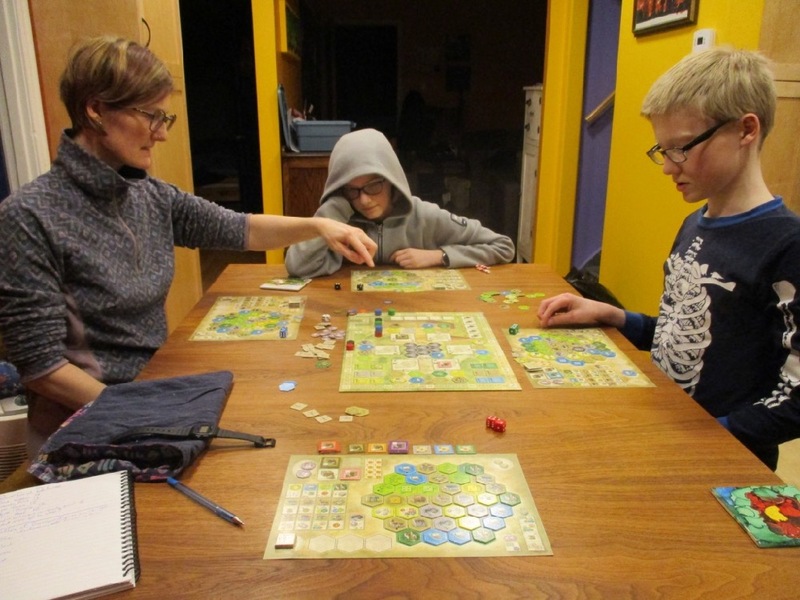 Such a lovely games roundup, and great to see you whole family playing games as a way of life. 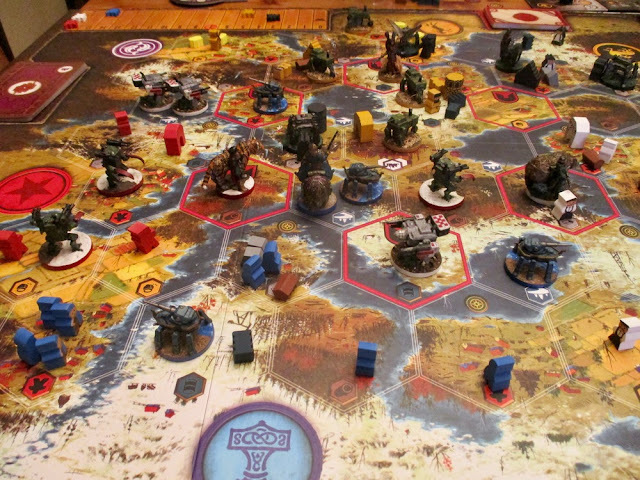 Like you I heard good things about Scythe but never met anyone who actually played it or enjoyed it, even though the box art if amazing.